Cars are parked along the slushy sides of Summer Street, surrounding an overpass with graffiti bordering its edges. As darkness envelops this corner of Boston, partially hiding the grime of the metal support system and the broken glass scattered on the sidewalk, the streetlights flicker on. 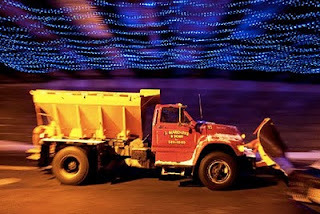 So does another set of lights — 4,800 of them. 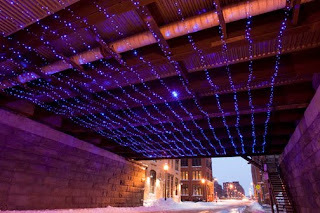 Strings of blue LED bulbs blanket the underside of the overpass in an installation piece by Lisa Greenfield and Daniel van Ackere titled “Starry Night.” The project is part of the first−ever Fort Point Arts Community’s Winter Solstice Public Art Series, meant to brighten what is often the dullest season in New England. “I walk by this area every day,” said Greenfield, who has a painting studio at the artist co−op building at 300 Summer St. “I was thinking, ‘What could I do to make this place a little brighter?’” Greenfield, who graduated from Brandeis University with a degree in studio art, has lived in the Fort Point community for about 15 years, and has created a number of installation pieces in the area — from “House of Cards” in the Fort Point Channel to a collection of Slinkys on the same Summer Street overpass. This has made a big difference in walking under that bridge. It used to be intimidating + scary, esp. to the uninitiated. But the 'simple' addition of blue lights have made it accessible + compelling.